If you are looking for a top contract manufacturing company in the U.S., please consider Aire-Master. 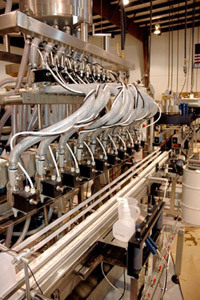 We provide a variety of product manufacturing services, including formulation, filling, packaging, and design. As a manufacturer, Aire-Master has been in business for over fifty years. We specialize in flexibility, customer responsiveness, and expert product knowledge. We do short runs, long runs, and everything in between. Aire-Master will go all out to turn your product around quickly, expertly, and at a competitive cost.